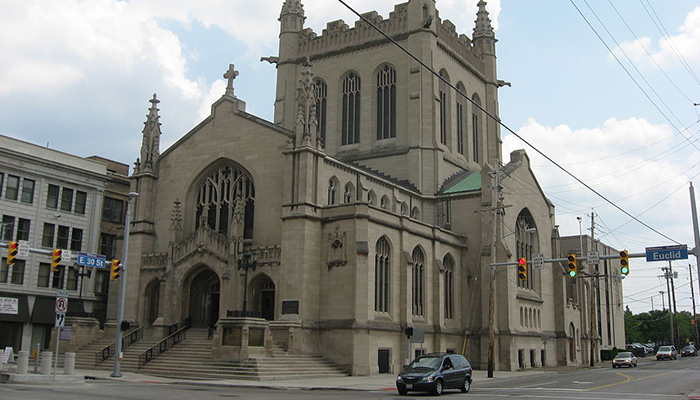 Cleveland, Ohio: First United Methodist Church to auction magnificent 52,000 sq. ft. Church and School Building at the corner of Euclid Ave. & East 30th Street in Cleveland, OH. Published Reserve Price set at only $250,000! This amazing structure was built in 1905 and added to the National Register of Historic Places in 1995. In 2010, the congregation left the Euclid Avenue building to merge with Epworth-Euclid United Methodist Church to form University Circle United Methodist Church in Epworth-Euclid UMC’s University Circle building. Euclid Avenue Congregational Church, whose building in the Fairfax neighborhood was destroyed in a fire in 2010, occupied the former First Methodist building from 2010 until mid-2014 before moving to a permanent building in South Euclid. The former United First Methodist building is currently unused. Now on February 22, 2018 the First United Methodist Church at 3000 Euclid Ave. will be offered at a Live On-Site Real Estate Auction on behalf of the Ownership. Handling the Auction Offering of the 52,000± Sq. Ft. facility on some 1± acres will be Chartwell Real Estate Auctions, a division of Hanna Commercial Real Estate. There will be 3 Open House Inspection dates on Thursdays, February 1, 8 & 15 from 10:00 A.M. to 12:00 Noon. This will lead up to the 11 A.M., Thursday, February 22 On-Site Real Estate Auction. Registration for the Auction will begin at 10 A.M. on that Thursday. To bid at auction all a serious buyer needs is to have in their possession a cashier’s or certified check of $17,500 made payable to Guardian Title & Guaranty Agency, Inc., located at 7550 Lucerne Dr, Suite 310, Middleburg Hts, OH 44130, Attn: Gayle Jonas, telephone: 216-898-4933. The scheduled closing date for the transaction is projected for March 29, 2018. For more information on the offering of the First United Methodist Church property, call Mike Berland at Chartwell Real Estate Auctions at 216-839-2032 or Mark Abood at 216-839-2027. Opportunities to acquire this type of unique opportunity may not come around again for 50 or more years, but it is now possible on February 22, 2018. Be at the auction to buy at your price! Hanna Commercial Real Estate Brokers & their affiliate, Chartwell Real Estate Auctions, has successfully marketed and sold properties at auction in over 40 states, four provinces of Canada, the Bahamas, and Europe. Hanna Commercial is part of TCN Worldwide with Commercial Brokerage Offices in over 200 Markets throughout the U.S and Worldwide including London, New York, Washington DC, Cleveland, Chicago, Dallas, Los Angeles, Sydney, Seoul, & Beijing. Howard Hanna Residential is the largest and best recognized Residential Real Estate Broker in Pennsylvania and numerous contiguous states.